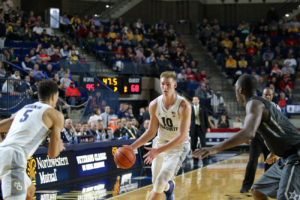 You are here: Home / Archives for Ed Morrow Jr.
Sam Hauser had 18 points and 13 rebounds and Sacar Anim added 18 points to lead 11th ranked Marquette past Providence 76-58 on Big East action in Providence, R.I., on Saturday. The Golden Eagles (23-4, 12-2 Big East) led by 11 points at halftime and shot 53.6 percent in the second half to finish 54.9 percent for the game. Markus Howard, who leads the Big East in scoring at 25.7 points a game, left in the first half with a groin injury. He returned to play the entire second half and a total of 36 minutes for the game, but finished with just 14 points on 2 of 12 shooting. Marquette got plenty of other help with freshman forward Joey Hauser scoring 15 points and junior forward Ed Morrow Jr. adding 11. The Golden Eagles finished 10 of 21 from 3-point range while the Friars hit 6 of 20. The win assures Marquette of a No. 1 or 2 seed in the upcoming Big East Tournament. The Golden Eagles, who have a one game lead on defending champion Villanova in the Big East standings, will play at Villanova on Wednesday. It’s a rematch of a game the Golden Eagles won 66-65 back on Feb. 9 in Milwaukee.